There has been a storm of Sharknado intensity in the social media this week about the donation of $65,000 worth of furniture from the mall/mail-order store West Elm for Gracie Mansion, the official residence of the mayor of the City of New York. Attention-getting headlines such as this one from Curbed New York, "De Blassios Swap 300-Year-Old Antiques for West Elm at Gracie," incited indignation that the comparatively uncouth new First Family of NYC would not appreciate the relatively lavish refurnishing untaken during the Bloomberg years, all paid for by private sources including a significant amount donated by Bloomberg personally. But it must be noted that the West Elm furnishings were for the private quarters of the residence and were given to the Gracie Mansion Conservancy, the non-profit group that supports the historic and decorative aspects of the property. The Entrance Hall in 1946. 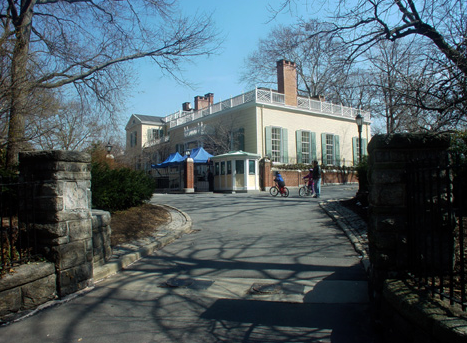 The Gracie Mansion Conservancy was founded in 1981 at the start of a $5.5 million renovation that was carried out 1981 to 1984 during the administration of Ed Koch. 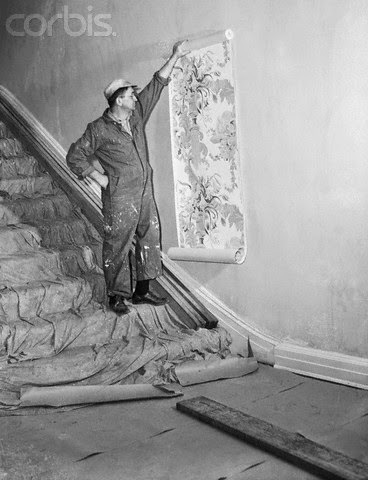 Two interior designers at their peak of popularity, Albert Hadley of Parish-Hadley Associates and Mark Hampton of Mark Hampton LLC, were invited to donate their services to decorate the mansion. Albert was to create a viable décor for the public rooms in the historic part of the house, essentially the Entrance Hall, Parlor, Sitting Room and Dining Room in addition to the State Guest Room suite. Mark was to decorate the Visitor's Entrance Hall, the Banquet Hall, and the Ballroom, all in the 1966 addition designed by architect Mott B. Schmidt and named in honor of former Mayor Robert Wagner, Susan, who had worked towards the creation of the wing but died before it was completed. A 1983 sketch of a hall by Albert Hadley. I worked at Parish-Hadley in the 1980s and assisted Mr. Hadley in the aspects of the Gracie Mansion project that required architectural input from designing the improvements to the State Guest Suite to locating electrical outlets and reviewing construction plans as they impacted the interior design. 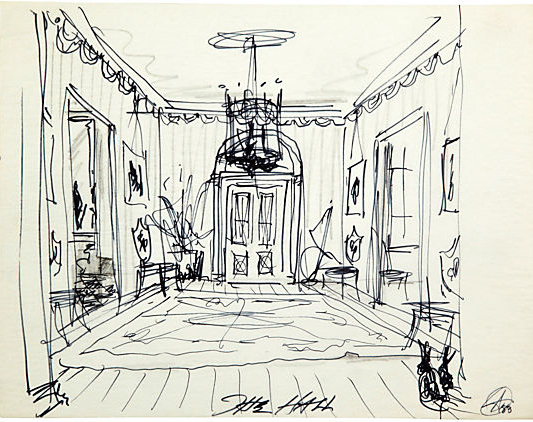 The sketch titled "The Hall" above may or may not have been intended for Gracie Mansion but it is indicative of the drawings Mr. Hadley used to convey his ideas for committee approval and stir up support from his deep-pocketed friends. And it is from the same time period as his involvement at Gracie Mansion. The Entrance Hall circa 1985. Photo via City of New York. 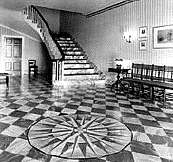 Although Mr. Hadley was not opposed to painting the floor in two tones of gray as a checkerboard, the results as carried out under the direction of the Conservancy (and executed by a compensated family member of the committee) were too theatrical, including the marbleizing of the stair risers (painted out in a later refurbishing) and the non-relating compass star. 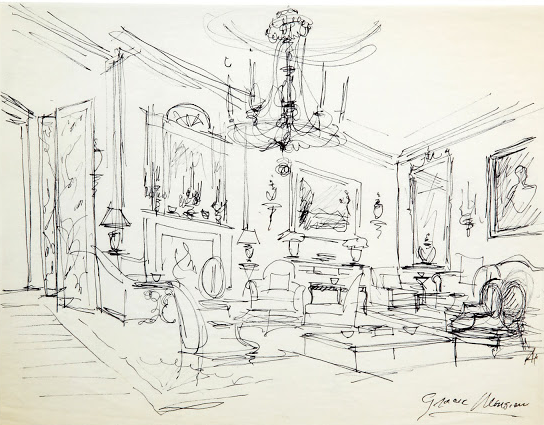 Albert Hadley's concept for the furnishing of Gracie Mansion was not unlike that carried out for the second floor rooms at the White House for the Kennedys that he had worked on twenty years before with Sister Parish, later becoming her business partner in the legendary firm Parish-Hadley Associates. The idea was to take some historic pieces of Mid-Atlantic, if not New York, origin of the late 18th and early 19th century and supplement them with quality new furniture and comfortable upholstery to allow these rooms to be realistically used on both daily and official entertaining occasions, not a museum setting despite the historic nature of the mansion. It was not unlike how the Kennedys used the Yellow Oval Room, Family Dining Room and the adjacent hallways in the White House, decorated to be attractive enough for distinguished guests but comfortable enough for family use. The Dining Room at Gracie Mansion, circa 1985. 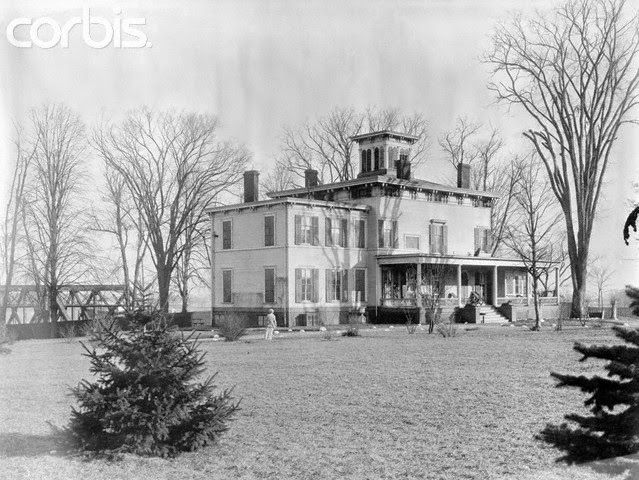 Despite being known later as the Albert Hadley Refurnishing of the historic part of the mansion, very little of the work he proposed was actually realized. Although Mark Hampton seemed to have fared better in the Wagner Wing, the Conservancy committee approved but prevented most of Albert Hadley's contributions from being realized. The Dining Room was the one space where Mr. Hadley's ideas were clearly evident. All the furnishings were donated by Hadley supporters including the scenic wallpaper. 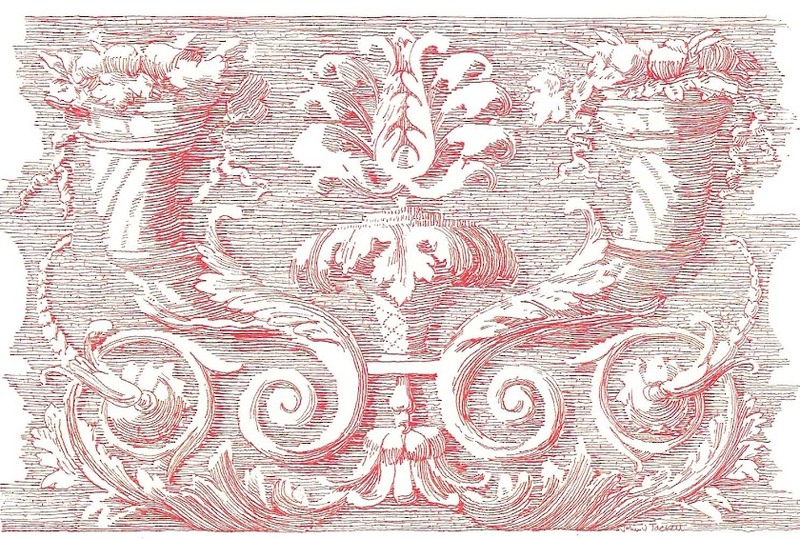 Among Albert's own donations, in addition to his time, were the simple gauze curtains hung from stamped gilt metal valances; the committee fought him on those, insisting much more formal window treatments would be better suited for the room. The final straw was the fitted carpet; the multi-colored striped carpet had been selected for the adjacent sitting room and a durable dark green moire-patterned plush-cut carpet was specified for the Dining Room. When the carpet company brought the goods (donated because of Mr. Hadley) to be installed, some ladies of the committee made a last-minute Executive Decision to switch the goods as the rooms were of similar size and the striped carpet could be stretched a bit to make up the difference. Since there was not any patterned fabric in the room, they thought the more colorful carpet was better. By the end of the day, Albert Hadley officially resigned from the effort and the committee was left to "play house" as it wished. showing the 1966 Susan Wagner Wing. the Big Old Houses blog. Despite press reports to the contrary, Mayor Ed Koch did not live in Gracie Mansion on a regular basis, preferring his rent-controlled apartment in Greenwich Village. A rule that allows that the only overnight guests may be the immediate members of the First Family and the official guests of the City of New York prevented Mayors Guiliani and Bloomberg from cohabitating there with their girlfriends. 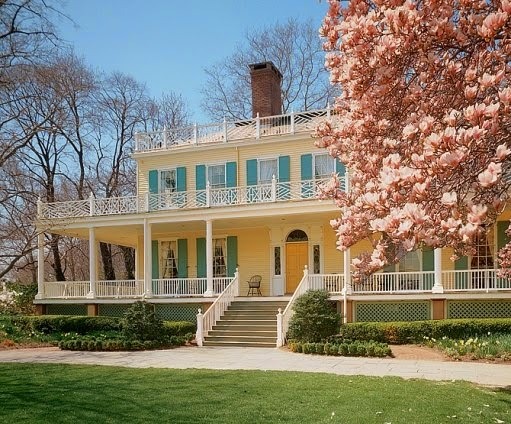 Mayor Bloomberg did contribute some of his own funds, however, to the $7 million restoration in 2002 with the interior design carried out by his decorator of choice, Jamie Drake. Those interiors may be seen as photographed by Architectural Digest here. Image from Bettman Archives via Corbis. More can be read about the history of Gracie Mansion on John Foreman's Big Old Houses blog here and on the official website of the City of New York here. In summary, the mayors bring their own furniture for their private rooms and it looks like the Gracie Mansion Conservancy arranged for this donation by West Elm to supplement the De Blassios' belongings although the furniture officially belongs to the Conservancy. The Big Old Houses blog reference is terrific, thank you. Poor Archibald Gracie (1755-1829), the rich Manhattan merchant who built it. He must have been heart broken. Hels, John Foreman's Big Old Houses articles are always interesting. And I love all his photos of details like door hardware. Thanks for commenting. "Design by Committee"---an oxymoron if ever there was one. And to think that the great Albert Hadley was one of its victims! Toby, committees are a notoriously difficult route to a successful result. Unless there is a Jackie-Kennedy-level chairperson, it can be a Lost Cause. Thank you for commenting. 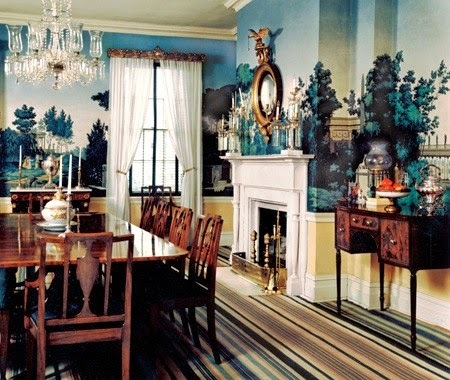 Hadley's dining room for Gracie mansion (sans carpet) is ( was ) fabulous! Karena, for better or worse, none of that mall/mail-order furniture is built to last. Next time we hear about that in the news, it'll be at the curb for trash pick-up. Thanks for commenting. How awful those committee ladies are! Most designers here in Naples refuse to touch condo lobbies for the same reason! Thanks for this most interesting and timely article. Dean, some designers take on committee projects only if there is a design fee paid for a presentation plus an additional fee for revisions. It may sound harsh, but an agreement on the 'rules' needs to be established up front. Thanks for commenting. Marry me!?!!! I am the biggest fan of your wonderful blog! Your, thank you for the compliment. Your comments are greatly appreciated.